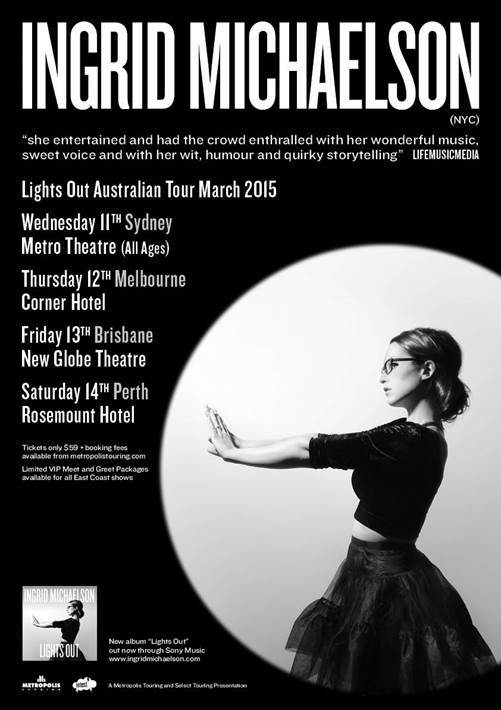 With her latest album Lights Out still causing quite a stir, NYC songstress Ingrid Michaelson is excited to announce her return to Australia. After selling out her previous two tours, Michaelson returns for a string of endearingly quirky live shows in major cities. Her sixth album, released in April 2014, debuted at the #1 U.S. Independent Billboard Charts, topped the U.S. Billboard charts at #5 and launched into the #2 position on the U.S. iTunes charts after its first day in store. The video for her new single, Girls Chase Boys, has attracted the attention of almost 2 million viewers for its charmingly flirty interplay between gender-bending girls and boys… chasing girls and boys. Michaelson’s aptitude for contagiously crafted performances and her panache for the unexpected sees it as no surprise that she has graced the screens of the likes of Good Morning America, The Ellen DeGeneres Show and The Tonight Show with Jay Leno, to name a few. This ukelele-playing diva has drawn comparisons to indie darlings Regina Spektor and Feist, whilst becoming known for her unique crystalline voice. playful disposition and thoughtful lyrics. Don’t miss the captivating chanteuse as she takes on Australia for a third time, armed with her trademark unconventional gusto, wielding her indie charm and intelligently crafted music. Originally scheduled for 2014 the tour is now set for March 2015! Please see new dates below!